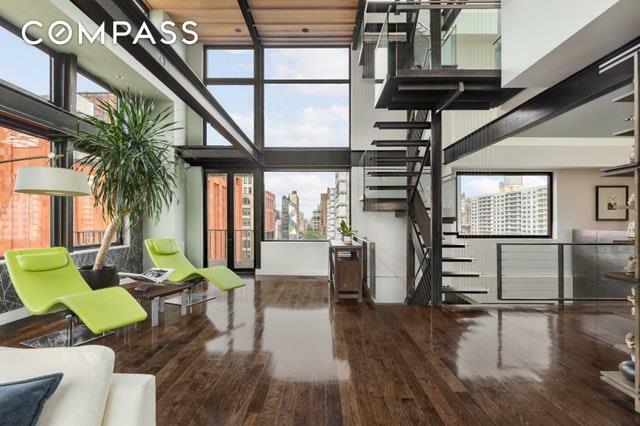 This rare and truly breathtaking Greenwich Village triplex penthouse exudes high-end craftsmanship and offers the ultimate private oasis in Downtown Manhattan. 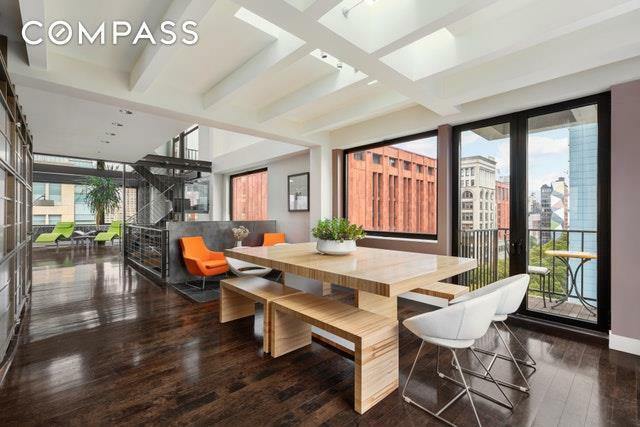 Occupying the top three floors of a boutique coop, this impeccable penthouse has approximately 4,000 square feet of living space and 1,300 square feet of private outdoor space including a landscaped roof deck and multiple balconies. The moment you step off the key-locked elevator, you are drawn to the four-story atrium that showcases the light and views of this one-of-a-kind downtown penthouse. The apartment boasts impressive 18 foot ceilings in the living room and incredible double height windows, which perfectly frame the Manhattan skyline and allow for a sun drenched living space that features pine accented ceilings, high-end sound system and Lutron lighting throughout. This four bed, four bath townhouse in the sky is built around the four-story atrium and crowned by an enormous skylight. 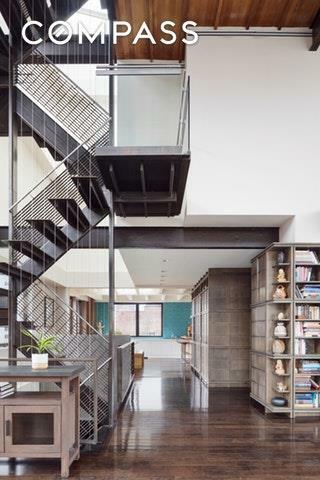 The floating steel and glass staircase doubles as a decorative sculpture perfectly blending contemporary and industrial design, allowing abundant sunlight to travel effortlessly through each floor. As you move through the multiple seating areas on the main floor, youll discover two private balconies, original industrial steel beams, custom cherry paneled walls, motorized window treatments, a wood burning fireplace, and a dramatic skylight over the main dining area. The spacious custom chefs kitchen featuring Jallo Sahara marble counters and teak cabinets. This kitchen features high-end stainless steel appliances including a Thermador cooktop, a Sub-Zero refrigerator, two Miele dishwashers, double ovens, as well as ample storage. Just one flight down, you will find four bedrooms, three bathrooms and the laundry room. Each bedroom is outfitted with custom closets and showcases varying views of New York City. Two of the four bedrooms feature a private balcony. The master suite is truly zen-like; the large and spacious bedroom features a gas burning fireplace, custom built-ins, and a large walk-in closet. The stone master bathroom comes complete with a rain shower and an oversized window with beautiful views of Washington Square Park. As you ascend two floors up, the third floor has been transformed into the ultimate entertaining space that includes a sleek marble kitchenette with breakfast bar overlooking the four story atrium, a full size Sub-Zero refrigerator and wine refrigerator, and a Miele dishwasher. The custom Carrera marble bathroom offers a beautiful shower with direct views of One World Trade Center. The main room is glass enclosed with north, east and west exposures and a wrap terrace, which includes a covered sitting area with heat lamps so the peaceful outdoor haven could be enjoyed no matter the season. No detail was spared in the renovation of this level, a motorized projection screen drops down from the ceiling and a murphy bed that allows this floor to be used as the perfect guest suite. The beautifully landscaped roof deck tops this spectacular penthouse, offering a full outdoor kitchen with gas grill, outdoor sink, two refrigerators, abundant storage and multiple lounge areas. The accent lighting and sound system make it the ideal outdoor entertaining space with views of One World Trade, 56 Leonard, both downtown and uptown skylines, and the New Jersey skyline. 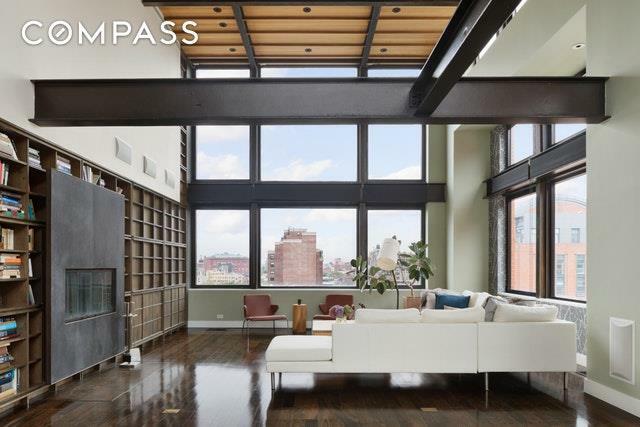 552 LaGuardia Place is a boutique co-op with one unit per floor and offers the new ButterflyMX smart video intercom system, part-time super and storage in the basement. Situated just south of Washington Square Park and north of Soho, you are surrounded by world renowned restaurants, shopping, nightlife, galleries, museums and easy access to multiple subway lines.